Gone are the days when your music or hi-fi system was restricted to one room and tethered by cables. You can now stream your music from a range of devices – smartphone, laptop, NAS drive – to multiple speakers around the home using a wireless connection. There are plenty of manufacturers offering this multi-room experience, but US company Sonos continues to lead the way with its long-established and well-developed system. Here, we'll guide you through everything about Sonos and the way it works – and help you set up your own multi-room system. What is Sonos? How does it work? Based in California, Sonos was founded in 2002 with one simple aim: to transform your home sound system for the digital age. Its products and software are designed to fill every room of your home with music, and the flexibility and functionality of its products has made the company a household name. The Sonos wireless sound system works by connecting one single speaker to your home network, then adding more Sonos units (up to a maximum of 32, dotted around the house) into the mix using a dedicated secure wireless mesh network known as Sonosnet. That network is integral to the way Sonos's multi-room speakers operate, as it sits at one remove from your home network. That means it's a stronger, more robust signal and isn't prone to dropouts when streaming music. Sonos launched the amplified ZonePlayer ZP100 and CR100 controller back in 2004. And it hasn't looked back since (despite the CR100 recently becoming persona non grata), continuing to innovate with new products to expand and enhance the listening experience at home while adding streaming services and voice control to its ever-growing roster of offerings. 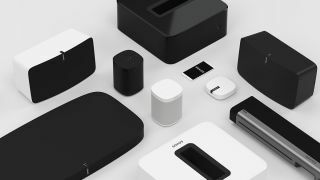 A major part of Sonos's appeal and meteoric rise in popularity lies in its hugely simple set-up process. The Sonos Controller app (available on Android and iOS) will walk you through the set-up, but it requires little more than pressing the speaker's sync button (to link them to your network and other Sonos speakers), finding the connected speaker on the app and entering details such as your wi-fi password. It's really that simple. And the slick, easy-to-use Controller app makes everyday use even easier. In the app, you can assign each speaker to a room of your house, programme it so the volume can be controlled via your TV's standard remote, and add your favourite streaming services. The app recognises which speaker you're using, and in which room you're using it. Adding other speakers is a breeze: just tap in the app to add a new speaker, press the sync button on the back and it's all done. It's still the smoothest multi-room set-up going. The current roster of Sonos products includes the Play:1 and Play:5 wireless speakers, the Playbar, Playbase and Sub, the Sonos One smart speaker with Alexa voice control and the Award-winning Sonos Beam soundbar with every feature thrown in. There are also ancillary products such as the Sonos Boost (£100). Connecting this box directly to your router expands and strengthens the wi-fi for Sonos products. It broadcasts 360-degree signals through walls and ceilings - ideal if you're setting up a multi-room system in challenging wireless environments. You don't have to part with your beloved hi-fi system for Sonos to work, either. If you have a traditional stereo-amp-and-speakers set-up, add a Sonos Connect (£350) to turn it into a streaming system. Similarly, the Connect:Amp combines streamer and amplifier – so you can simply add it to your existing pair of stereo speakers. The company's latest prized asset, though, is the Sonos Amp. Sonos’s Patrick ‘PG’ Gall describes the new Amp as “the Connect:Amp on steroids”, offering two pairs of speaker terminals, a subwoofer output, two ethernet sockets, a stereo analogue input and an HDMI socket that makes it as much home cinema amplifier as hi-fi component. The Sonos Controller app is a large part of the system's charm. As well as walking you through the set-up, it's where you can control all aspects of your Sonos products and access your entire music library. Sonos's mission statement is to offer 'all the music on Earth', so – along with playing music from digital libraries (such as from a NAS device or a laptop) – you'll find the widest choice of streaming service compatibility on the app. Sonos's aim is to be platform agnostic, and it's the most comprehensive list we've seen in any multi-room product. Apple Music, Amazon Prime Music, Google Play Music, Spotify, Deezer, Pandora, Soundcloud, TuneIn... the list of supported apps goes on. It's worth noting you will need premium subscriptions for some of these. Additionally, Qobuz and Tidal bring CD-quality, lossless streaming to Sonos. While the other music services offer files up to 320kbps, Qobuz and Tidal offer unlimited streaming access to CD-quality FLAC files at 16bit/44.1kHz for a monthly subscription charge. One of Sonos's best features is that you can build playlists directly within the Sonos app, and from multiple sources as well. So if you want to add tracks from both Spotify and Tidal onto a playlist of tracks from your NAS library, you can. And while Sonos continues to eschew Bluetooth, the recent update to include AirPlay 2 (for certain memebers of the Sonos family, at least) brings iOS devices into the fold too, and opens up your multi-room system to other brands of speaker. Finally, there's voice control. Continuing its agnostic approach, Sonos wants to offer all three main voice assistants – Amazon's Alexa, Apple's Siri and Google Assistant – in its products. The Sonos One was the first to arrive with Alexa support, with the Sonos Beam soundbar following soon after. The Beam and One are also due to get a Google Assistant update in 2019, although Sonos has also said that 'earlier speaker models' will be updated to 'work' with the Assistant. As the earlier Sonos products don't have microphones built in, you'll almost certainly need a microphone-toting middle-man device (such as a smartphone or Google Assistant smart speaker) to control it. Where you place your Sonos speaker in the room will affect its sound. Sonos's Trueplay feature within the Connect app (available on iOS only) aims to counter this, using the microphone on an iPhone or iPad to measure the response of the speaker in your room and tweak its sound to suit. This set-up process runs through a series of test tones and sweeps, which will be familiar to anyone who has set up an AV receiver. The process tunes your speaker to the room, adjusting the bass and the treble to get it sounding the best it can. Trueplay's calibration is particularly useful if your Sonos speaker is placed in a less-than-ideal location, such as tucked into a corner. Of course, if you don't like the changes, you can always set it back to default. Of course, while Sonos bills itself as a "wireless hi-fi system", there's no denying a little more cash spent on a dedicated separates system will deliver better sound. There are myriad streaming options should you value sound quality over the flexibility Sonos offers. You can stream music from your NAS device and other digital libraries to the Cambridge CXN, for instance, to get fantastic audio. And the more streamers (and speakers) you buy, the more rooms of music you can have. You could even add on the excellent Arcam rPlay to inject streaming powers to your old hi-fi system. But you don't get the multi-room functionality, nor the simple, brilliant interface of the Sonos app with those options. You would, however, get high-resolution audio support – something still not offered by Sonos. Want to play downloaded 24bit/192kHz files? You're out of luck, as Sonos tops out at CD-quality music. It's an area where rivals such as Bluesound and Denon have been quick to capitalise. Other formats not supported by Sonos products include DTS, Dolby Atmos and Bluetooth. And what happens if your home network is down? There not being an alternative (and offline) streaming option remains one of our biggest niggles about Sonos (you'll still need internet for AirPlay and voice control), but you can use the Sonos Play:5's 3.5mm input to hardwire music. Sonos says high-res audio support "not on the roadmap"
"So if I want a wireless multi-room speaker system in my home, I must turn to Sonos?" Not so fast. There are other options to consider, some of which offer a different flavour of sound or a different set of features to challenge Sonos's dominance. The first of these is one of the newer entrants into the multi-room market: Audio Pro. We're big fans of the Swedish company's individual wireless speakers (which have picked up plenty of What Hi-Fi? Awards), so we aren't too surprised a multi-room system made from these superb speakers (Audio Pro Addon C5, Addon C3 and Addon C10) sounds great. What surprises us more is how its musicality is unrivalled by anything at a similar price – or even quite a lot more. Such is the appeal of Audio Pro's expressive, nuanced and precise performance, we prefer it – in pure sound quality terms – over Sonos and Bluesound systems. Audio Pro's simple app can be a little buggy (and isn't anywhere near as fully-featured as Sonos's) but, for sound quality at an affordable price, this multi-room system is currently unbeatable. The first genuine threat to Sonos was Bluesound, whose key hook of support for high-resolution audio made it our preferred multi-room system for years (as multiple Awards trophies will attest). Its wide range of products (which includes wireless speakers, a streamer, amplifier and soundbar) and subtly detailed and punchy sound made this pricey system worth investing in. But that was before Audio Pro came into the picture with its superior sounding speakers for less money. It remains a solid-sounding system despite losing its fifth star, though, with an improved BluOS app that now supports Alexa voice control and makes daily use a breeze (even if it's still can't match Sonos's intuitiveness). If you have deep pockets and a library full of hi-res music, it's worth a punt. Other multi-room systems worth looking into are Denon HEOS (which supports hi-res, including DSD 5.6MHz files) and Bose SoundTouch. Here’s a question: if the Sonos One and Sonos Beam incorporate Alexa voice control (and will get Google Assistant at some point in 2019), is there really any reason to buy the Amazon Echo or Google Home speakers? There is: both Amazon and Google's ranges of voice-assisted speaker products offer a wealth of smart home features that aren't available when they're incorporated in third-party speakers like Sonos. And while previously we'd say these smart speakers are more suited to those who prioritise the fun smart perks over outright sound quality, that tide is now turning. Amazon's latest generation of Echo speakers – particularly the Echo Plus (2018) and Echo Dot (3rd gen) to a lesser extent – are all good speakers in their own right. The entire Echo family (including older generations) also all multi-room speakers, with Spotify, Amazon Music, Apple Music and TuneIn radio supported for multi-room streaming. Google's Home and Home Mini similarly connect to any number of its voice-controlled wireless speakers for a multi-room set-up, and its compatibility with Chromecast streaming (and therefore other products with Chromecast built-in, such as smart TVs) should set it apart from Amazon's offerings, too. We're not wild about any of these products' audio performances, however: they're acceptable for background listening, rather than being your main music system. But most pertinently, they both offer cheaper alternatives to Sonos. You can get an Amazon Echo 2 for just £90 (or the bigger, better Echo Plus for £140), while the Google Home is just £130 – all of which are more affordable than Sonos’s £200 smart speaker. As an entire ecosystem, Sonos is hard to fault – if you don't mind sacrificing hi-res audio, of course. Sensibly priced, beginner-friendly and with an appealing expand-as-you-go ethos, it's a multi-room solution to be reckoned with. Now that you're armed with all the information, fancy creating your own wireless home sound system? If you're investing in a Sonos speaker or soundbar, take a look at our round-up of all Sonos products that we've had in our test rooms. The latest addition to the Sonos family, the Beam is our new Product of the Year winner for soundbars. We think this smaller soundbar is one of the best sound-per-pound products that Sonos has produced. Wide and spacious scale, chunky weight and clear dialogue all combine to deliver an impressive performance that we wouldn't expect from its compact dimensions. Headline features include an HDMI ARC connection, support for Alexa, Google Assistant (in 2019) and – via AirPlay 2 – Siri. "A Play:1 with Amazon Alexa built-in" is the most succinct way we can describe Sonos's much vaunted new smart speaker, Sonos One. It sounds great, too – solid, sophisticated, spacious and organised – and Alexa's integration (especially with Spotify) makes it a dream to use. You can make a stereo pair with two One speakers, and with the AirPlay 2 update now live and Google Assistant support coming early 2019, the One is one of the best-specified and most versatile smart speakers around. An alternative to the Playbar, this product is designed as a strong, flat soundbase you can perch your TV upon. Sporting the exact same features as the Playbar (but now with the added bonus of AirPlay 2), the Playbase offers a different design for those who want to boost their TV's sound. The revamped Play:5 (2015) came packed with upgrades and improvements, such as an enclosed chassis that adds a new driver instead of a port. All the drivers have been redesigned, and you can position the speaker both horizontally and vertically, and you can make a stereo pair. There are also touch-sensitive controls, a 3.5mm audio input and AirPlay 2 support. It's pricey, but the big and bold performance will certainly appeal. The Play:1 is the entry-level gateway to the world of Sonos. The compact wireless speaker may not be portable, but it's about the size of a bag of sugar and can fit into any space. Ease of use is a huge draw, but it's backed by good sound quality and an affordable price. It's perfect for getting started on your Sonos journey or adding bits – such as rear surround speakers – to an existing set-up. You can also link two Play:1s together to make a stereo pair. Sonos in a soundbar. It combines the streaming features of Sonos while improving your TV's sound. It only has a digital optical connection (no HDMI) and there's no DTS support, but it's a decent addition to your TV system. Add two Play:1s or Play:3s and you've got yourself a 5.1 system, too. If you feel as though you're missing out on really deep basslines from the Playbar (or Playbase), simply add the matching wireless Sub for extra oomph. It's not as punchy as we'd like and it's rather pricey, but the Sub does add more power, scale and weight to the low end for movies and music alike. Which is the right Sonos speaker for you?